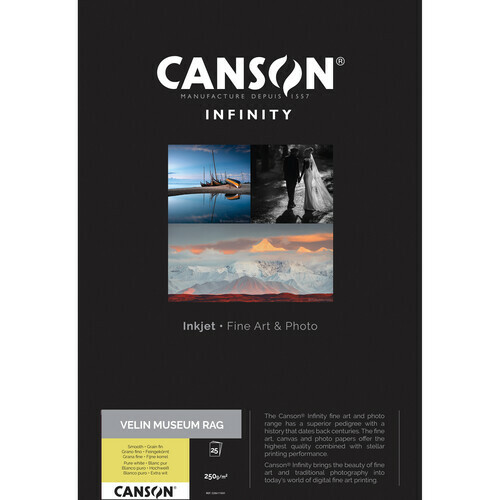 A fine-grained surface and structure chosen for lithographs, etchings, and more, Velin Museum Rag Paper from Canson Infinity brings velin into the digital age with inkjet receptive coatings and a pure white tone. Available here as a 25-pack of 8.5 x 11" sheets, this version of the mould-made 100% cotton rag paper features a basis weight of 250 gsm and measures 16.3 mil thick. It also uses no OBA content and reaches a whiteness of 83.52%. Additionally, it is acid free and internally buffered for longevity while it is instant drying and highly water resistant for durability and handling. Box Dimensions (LxWxH) 11.6 x 9.0 x 0.8"
Velin Museum Rag Paper (250 gsm, 8.5 x 11", 25 Sheets) is rated 5.0 out of 5 by 1. Rated 5 out of 5 by rrkgitto from Beautiful paper Great for black and white.